Along with supplying the whole world with oddly named furniture, the Swedes also have a fine tank industry. While German designs laid the engineering foundation, the Swedish military harnessed their country's attention to detail to grow an array of interesting models. Rich and varied, the Swedish tank building industry has enough machines to make a diverse tech tree. 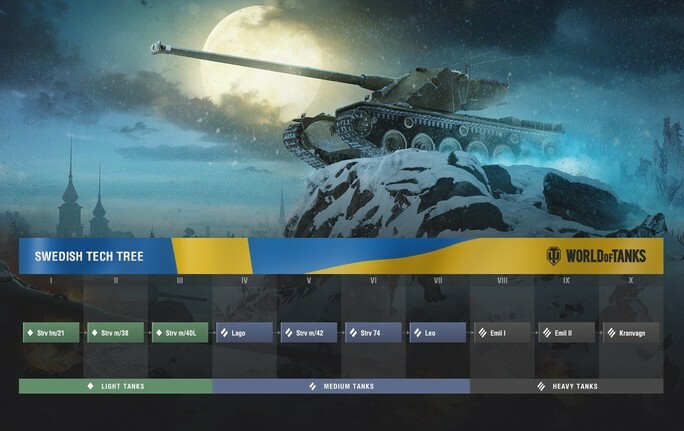 Two lines of Swedish warfare will be blasting their way into the game in Update 9.17: tank destroyers and a hybrid line of light, medium, and heavy tanks. And if you, like the rest of us, are waiting in anticipation for them to hit the battlefield, consider yourselves invited to a guided tour of these new vehicles. Start your engines, off we go! 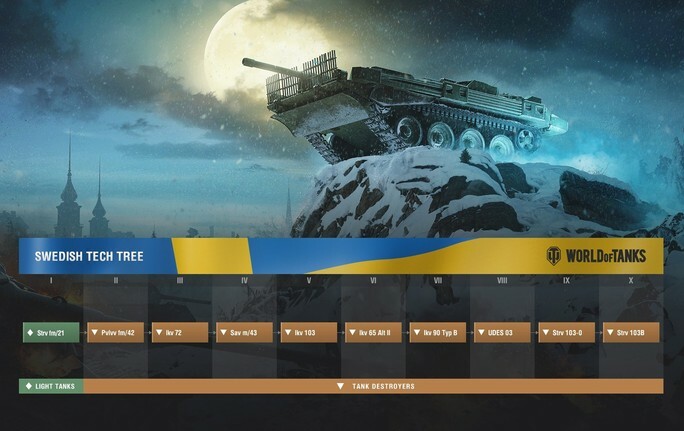 Another great Swedish invention: the word “smorgasbord”—the perfect way to describe the variety of tanks you’ll find in the Swedish Tech Tree. From lights, mediums, TDs, and heavies, there’s a little something for everyone. At tier II is the Strv m/38 light tank. It’s a perfect introduction to the line thanks to its balanced stats. Next is the tier III Strv m/40L light tank, which is similar with decent gun elevation/depression and a striking profile. What’s a “Lago”? A solid tier IV medium tank that follows in the tracks of previous tiers. Up from that is the tier V Strv m/42 medium tank. It’s on par with the Sherman M4, T-34, and Pz.Kpfw. IV, but with a remarkable 15° gun depression. Keeping things squarely medium at tier VI is the Strv 74, which sports one of the best guns for its tier. At tier VII is Leo, living up to its name with the best top speed for its tier and the highest damage per shot, making it a real predator. Emil I is a tier VIII heavy tank that borrows the magazine reloading system of the AMX 50 100. However, it has an increased reloading time (3 seconds vs 2.75 seconds) and lower penetration (217 by APCR shells vs. 232 by AP shells). The armor can easily block shots from lower or same-tier opponents. Its relatively small size and great gun depression (12°) makes the Emil I command an array of situations. Fittingly, the Emil II follows at tier IX. It, too, can be compared to a French tank, in this case the AMX 50 120. However, it's smaller and has better frontal turret armor. Its decent gun depression/elevation allows this Swede to sit pretty, away from the heat of battle and pick off foes. At the top of the tree is the tier X heavy tank Kranvagn, about as easy to pronounce as the furniture. Playwise, it sits between the AMX 50B and T57. Researchable from the Strv fm/21 light tank, this branch of tank destroyers adds nine fine vehicles. They're swift, well-armed, and excellent at keeping low profiles. Tiers VIII–X introduce new gameplay mechanics: Travel and Siege modes. Once you reach tier VIII's UDES 03, there’s one simple rule: avoid firing when going at full speed; in Travel mode, it's the worst of its tier (but considerably better at it than its brethren at tiers IX–X). Just find a favorable spot and empty your gun in Siege mode, because that turns the UDES 03 into the most formidable TD tier VIII has ever seen. Top-tier Swedish tank destroyers, the Strv 103-0 and Strv 103B, demand rapid decision making. If you’re in Travel mode, use speed to your advantage and don’t even think about shooting—save it for Firing mode once you’ve secured a good position. With their highly sloped armour, you should be able to bounce shots with uncanny frequency. We hope you enjoyed our tour of the Swedish line and you can expect more info on Update 9.17 in the near future. See what else we’re cooking up for 9.17: Supertest summary.